When I began to read Charlotte Mason’s writings in early 2005, my purpose was to become a more effective homeschooling teacher. I trusted that Mason’s method was effective, but I realized that I had to learn it in order to apply it properly. So began the long process of reading, experimenting, applying, and (slowly) improving. I knew from the start that nature study was an important part of a Charlotte Mason education. This seemed to loom before me as the biggest challenge I would face. How could I follow the Mason method and not do nature study? And yet I knew nothing about nature or how to study it. To the books, then! Surely they will show the way! My first step was to order several guide books: some field guides, and some books about local parks. I gradually learned where the native wildflowers grow in my community. Finally I approached the Gen Crema Trail armed with a trail guide and photographs to help me identify what I would see. Alas, where I was supposed to see easily identified specimens side-by-side, I found a bewildering maze of tiny flowers of every color, shape, and size. Nothing looked like anything in the photographs or the field guides. I was lost. I was frustrated and discouraged, but I could not give up. Volume 5 of Mason’s series has a section entitled “Parents in Council.” One of the parents says, “Every one should know something about such facts of Nature as a child is likely to come across. But how to get at this knowledge! Books?” Another replies, “We want the help of the naturalist, an enthusiast who will not only teach but fire us with the desire to know.” That’s what I needed. The help of a naturalist. Many months later, to my delight I learned of a plant identification class to be held at Chiwaukee Prairie. I signed up months in advance and arrived with enthusiasm on the first day of the class. We went to the Gen Crema Trail, but this time I had a human “field guide,” someone who could disentangle this maze of botanical complexity. She could identify the flowers all right! I left that first day with a confused jumble in my head. I had heard so many names and seen so many plants, all correctly identified. And yet I remembered nothing. I had no frame of reference for this knowledge! But each subsequent class I brought along my digital camera. I photographed each plant as it was identified and I wrote down the name. As the months went by, I slowly built up my own field guide on Shutterfly.com. A year later, a new summer, and I was back in Chiwaukee Prairie in the plant ID class. Eventually after so many encounters with the wildflowers, a strange thing began to happen. I didn’t just start to remember the names. I didn’t just start to recognize the species. I actually began a relationship with the flowers. I found that I had favorites. I found that I would take delight in seeing how the spiderworts were doing this month. The thistles and the goldenrods began to be like friends. Above all the flowers in the prairie, one became my absolute favorite. In unique beauty and exquisite design it was (and is!) unmatched: the wood lily. 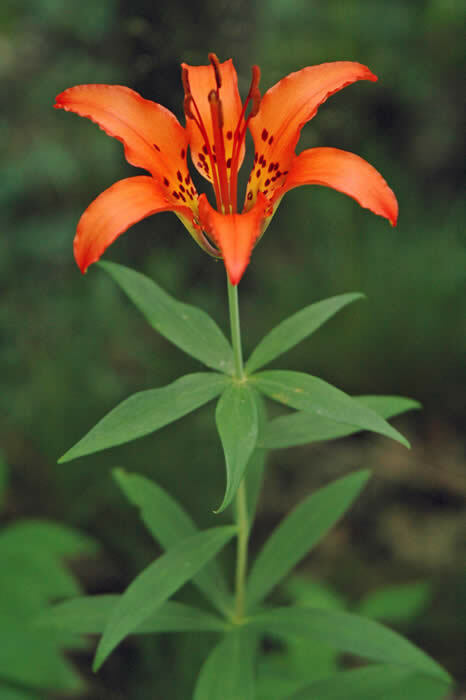 I learned that the wood lily only bloomed for a few days in July. I put the dates on my calendar, because I did not want to miss the chance to see my special prairie friend. But nature study is more than identifying specimens. I knew that nature study also involves observation and dry brush. But here I was stuck. First, I knew nothing about watercolors, and dry brush seemed hopelessly difficult. Second, I was not allowed to remove any plant material from Chiwaukee Prairie. How could I do dry brush with my children when we can’t take the specimens home? The answer to my two questions did not come from a book. “As for knowing the thing itself, let me be introduced by him that knew it before me.” At the ChildLight USA 2011 conference, I (finally) went to the Nature Study workshop led by Deborah Dobbins. There Deborah taught me how to dry brush. My fear of the unknown gave way to my enjoyment of a new activity. But most importantly, Deborah removed my final obstacle. She said that when the class is small enough, the best way to do nature study is to take the watercolors to the plants. Take the watercolors to the plants? Of course! Nothing I had read gave me that idea! I needed the help of someone “that knew it before me.” Once I understood the principle, the execution was straightforward. Within weeks, our family had a portable plastic dry brush box. And what a delight to see my children make their first dry brush of flowers by the Gen Crema Trail. The first chapter of “Parents in Council” ends with parents deciding what to do next. “We must learn what we should teach,” one parent says. Indeed I know that – that’s why I began to read Mason in the first place. But now I realize what those “Parents in Council” understood. Sometimes the teacher needs a trainer. And sometimes that trainer is not a living book, but a living person.